Irish beer mug Christmas ornament is enhanced with textured froth along with a witticism. 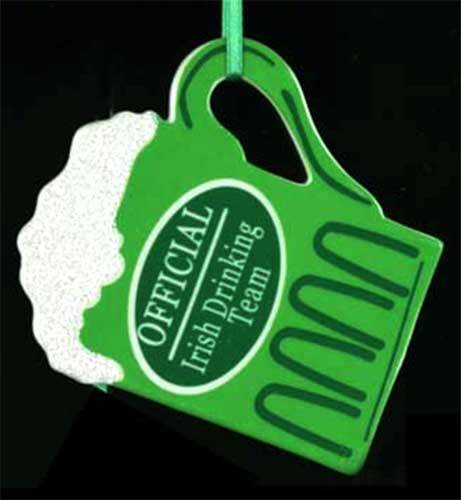 The caption on this Irish Christmas ornament says, Official Irish Drinking Team. This Christmas ornament is an Irish beer mug that is enhanced with a foamy head along with a saying. The green porcelain beer mug ornament measures 3 1/2" wide x 4" tall; it is ready to hang on your Christmas tree with the included green ribbon. The Irish ornament is gift boxed, complements of The Irish Gift House. Irish beer mug ornament is enhanced with textured foam along with a witticism. Irish Christmas ornament is a beer mug shape that is enhanced with textured froth along with a witticism.